Mount Kailash Helicopter Tour offers stunning views of the Kailash and Mansarovar Lake from the helicopter. This holy tour is famous to the holy pilgrims who have keen desire to visit the Holy Mount Kailash and Manasarovar lake. Those who have limited time and have desire to go for the Pilgrimages tour this tour can be adventurous. Holy Mount Kailash lies in the Gandise Mountain range in western Tibet. being sacred and holy, Hindus, Buddhists, Bonis, and Jainis pilgrims go to this mountain to fulfill their wish and dream. According to the Hindus, believe this mountain is inhabitant by the creator and destroyer of world, Lord Shiva. Similarly, Mansarovar is a high altitude fresh Water Lake in the World. 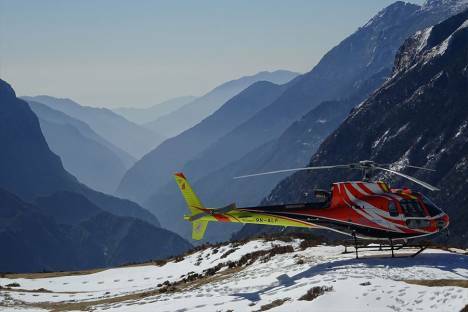 The Helicopter tour to Kailash begins with scenic flight from Kathmandu to Nepalgunj. From Nepalgunj, we will fly to Simikot, the western hilly small town of Nepal. From Simikot, you board on a helicopter for the flight to Hilsa, the place close to China/ Tibet border. After crossing the border you start the scenic drive on Tibetan plateau to the Mansarovar Lake. The stunning view during Mount Kailash Helicopter Tour will be one of the unforgettable journeys through a lifetime. Book the Mount Kailash Helicopter Tour with Himalayan Trekking and explore the beauty of Mount Kailash and Lake Manasarovar. Day 2: Sightseeing in Kathmandu. Fly to Nepalgunj. Today morning after breakfast, will visit Pashupatinath Temple (One of the holiest Shiva temples in the earth located 4 km east of Kathmandu at the bank of Bagmati River. Here you see many Shiva temples and meet many Hindu Sages) & Jal Narayan temple (Jal Narayan, locally known as Budhanilkantha, is open air temple of Lord Vishnu who is relining in the pond. 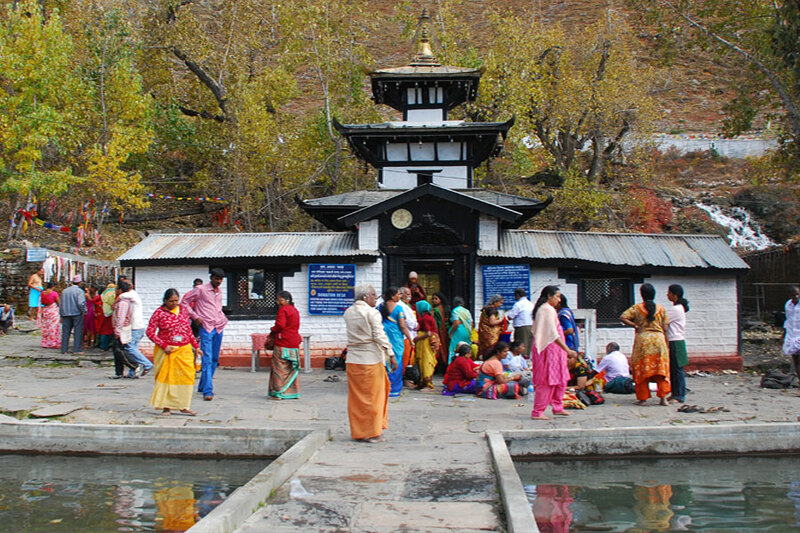 This temple is situated below the Shivapuri hill at the northern end of Kathmandu valley). Then afternoon will fly Nepalgunj, western city of Nepal near the border with India. Overnight at hotel in Nepalgunj. Day 3: Fly from Simikot. Heli Charter flight from Simikot to Hilsa. Drive to Purang. At morning will fly from Nepalgunj to Simikot by domestic airlines. Simikot is the administrative headquarters of Humla District of Karnali Zone in the mountain region of northwestern Nepal. Upon arrival at Simikot airport, will board on Helicopter to fly for Hilsa. Walk 10 minutes to cross border of Nepal and China. Then take a drive to Purang (Taklakot).Overnight at guest house in Purang. Day 4: Day for acclimatization in Purang. Day 5: Drive from Purang to Mansarovar. After breakfast will drive to Mansarovar Lake. En route before reaching Mansarovar Lake you see Rakshyas Tal. Today is the precious day of lifetime as you have the first sight of Holy Mt. Kailash and holy lake Mansarovar. We can have Pooja and Holy bath at Mansarovar. We will also vist Chu Gompa which is in the shore of Mansarovar Lake. Overnight at guest house in Mansarovar. Day 6: Drive from Mansarovar to Darchen and then to Shersung. Trek to Dirapuk. 1st day of Parikarma. Day 7: Trek from Dirapuk to Zuthulpuk. 2nd day of Parikarma. Today our trek is a little bit harder to walk because to go up all the way to Dolmala passes (5723 meter/18776 feet). It is highest point in all this trip and then way down. From this trail you can have view of back side of mountain and many prayer flags at highest point. Also pool of great compassion at side of route which is called Gauri Kund by Hindus. In Zuthulpuk a temple and shrine is built around Milarepa’s cave where Milarepa, one of the most widely known Tibetan Saints, took dark retreat few years. He printed his hand and feet on the rock. Overnight at guest house in Zuthulpuk. Day 8: Trek from Zuthulpuk to Darchen. Final day of Parikarma. Drive to Purang or Hilsa. Today is short and easy walking day. You walk through grassy plain area along the river. The trekking end point is 4 km before Darchen. Once you reach there your vehicle comes to pick you up then drive back to Purang or Hilsa through the same previous road. Overnight at guest house in Purang or Hilsa. Day 9: Heli Charter flight to Simikot. Fly from Simikot to Kathmandu connecting Nepalgunj. Early morning will drive to Nepal border. As soon as possible fly by Helicopter to Simikot. From Simikot fly to Nepalgunj by domestic air and then same day connect flight back to Kathmandu. Overnight at hotel in Kathmandu. Our tour leader transfer you to the Kathmandu International Airport in time for your flight and help you get on board for your onward destinations. Return with the exciting memorizes of the Mount Kailash Helicopter Tour. Arrival and Departure transfers from airport to hotel in Kathmandu and Nepalgunj. Kathmandu-Nepalgunj-Simikot both way air fare by regular flights. Kailash Tour Rescue transport encase needed if some one goes back earlier than the group. Pony/Horse service during the Kailash parikrama, extra personal porter, and yaks ride if required.